An alternative attribute rolling method suitable for use in tabletop role-playing games with attribute scores normally based on a roll of three six-sided dice. This document presents a simple method for generating Attribute scores in the 3d6 range that will tend to be more balanced and range from 8 to 14. 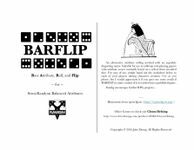 Originally released under the title of "Flip 6", the product was re-titled and republished as "BARFLIP".